We discovered warm waters 800 meter down a hole drilled 100 m through Petermann Gletscher ice. Every hour an ocean sensor querries temperature, salinity, and pressure and reports its readings to a weather station atop the glacier. The warm waters come from the Atlantic and enter the Arctic Ocean near Spitsbergen. Prior to hitting our sensors in an 800 m deep fjord in northern Greenland, the water moved along Siberia, Alaska, and northern Canada before snaking its way into Petermann, Greenland to perhaps melt this glacier from below while surface air temperatures are already below freezing. It is a long way from home for both those Atlantic waters and us scientists and crew here aboard the Swedish icebreaker Oden and four hardy explorers camping on the floating ice of Petermann Gletscher. Peter Washam on Petermann Gletscher at an ice drilling camp. Cables and ropes against tent are used later to connect ocean sensors to the weather station. Keith, Paul, and Mike of the British Antarctic Survey as well as my graduate student Peter deployed 5 ocean sensors with cables and ropes. A weather station designed by David Huntley of the University of Delaware provides the command and control between ocean sensors, battery and solar panels, and the Iridium satellite modem to send data back home. For me this engineering project took over much of my life the last 6 months as all testing and coding has been done while traveling. Much problem-based learning took place not for pedagogic reasons, but as a necessity to make something special work. And work it does. 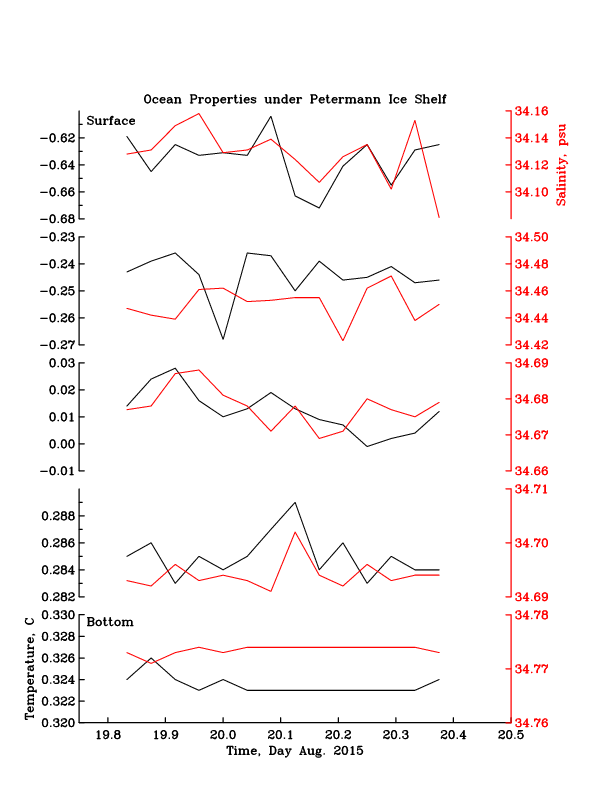 First 14 hours of ocean data from below the floating ice shelf of Petermann Gletscher as of 20. Aug. 2015. Top time series are from just under the ice shelf near 120 m while the bottom time series is from a sensor at 810 m below the surface. 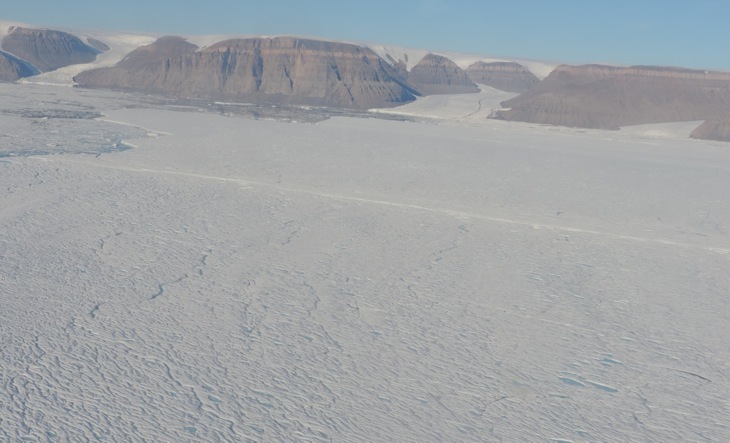 These are the first and only data from below a glacier in Greenland that do not involve a person tending to instruments, computers, and cables with a helicopter or aircraft waiting. Our observing system is fully automated and the first 14 hours of data were collected by my computer on the ship calling the computer on the weather station which then sends the data after some computer-to-computer hand-shaking. The weakest and most fickle link in this chain is the Iridium satellite phone to move data through thin and cold air. Senator McCain of Arizona called the ship yesterday and was rudely disconnected by Iridium the same way that our ocean weather station is. 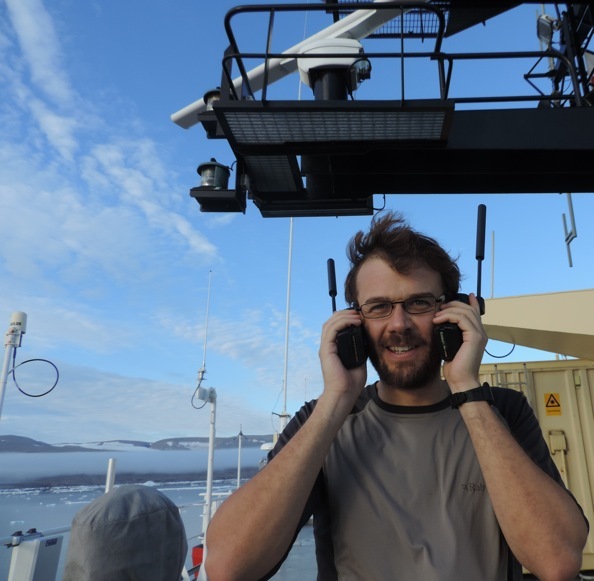 Rob Holden testing Iridium phones above the bridge of I/B Oden. Unlike busy, engaged, and well-meaning politicians, however, the computers will tirelessly try again and again every three hours to send the data back that the weather station on Greenland accumulates no matter how well Iridium is connecting it to us. Power is key as is a flexible budget that adapts to both scientific needs and environmental conditions. I here do not talk about politics in Washington, DC, but the design of the weather station that is powered by both batteries and solar panels while the Iridium modem is the most energy gobbling component of the ocean observing system. Hence it is switched off at all times except a 20 minute window every three hours. I will have to change this window to 20 minutes once per day in the winter when the station will have to operate in complete darkness. So, many challenges are still ahead which includes a mechanical design to fix a weather station on a melting glacier, but alas, winter here is already upon as with air temperatures on and off the glacier below freezing. New ice forms in the early morning hours already. 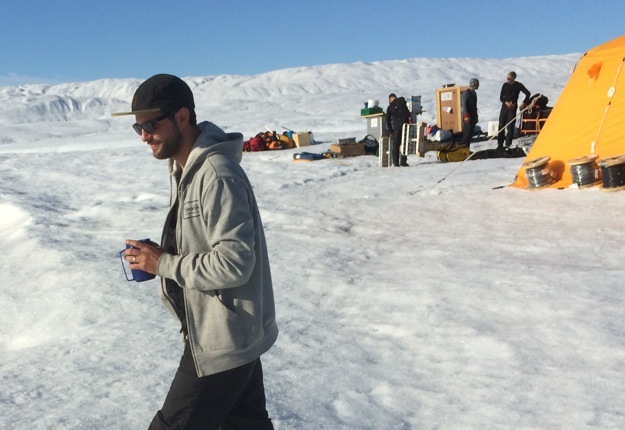 This entry was posted in Greenland, Petermann Glacier, Petermann2015 and tagged Arctic Research, Greenland, Petermann. Bookmark the permalink. Wow, this is awesome. Well done, Andreas and Peter! Looking forward to your analysis of the data.